Click the arrow down Icon next to Add Employee button from the top right of the Staff tab. Skills define any special abilities your employees have. This can include things such as CPR Certification, Second Languages, etc. 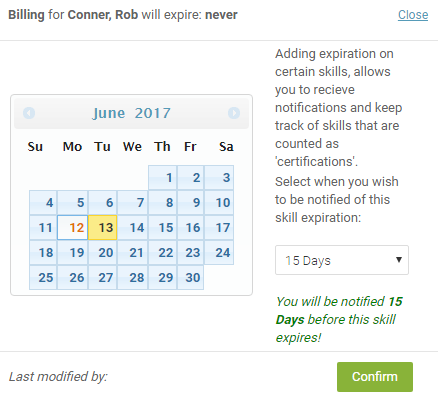 Adding expiration on certain skills, allows you to receive notifications and keep track of skills that are counted as 'certifications'. 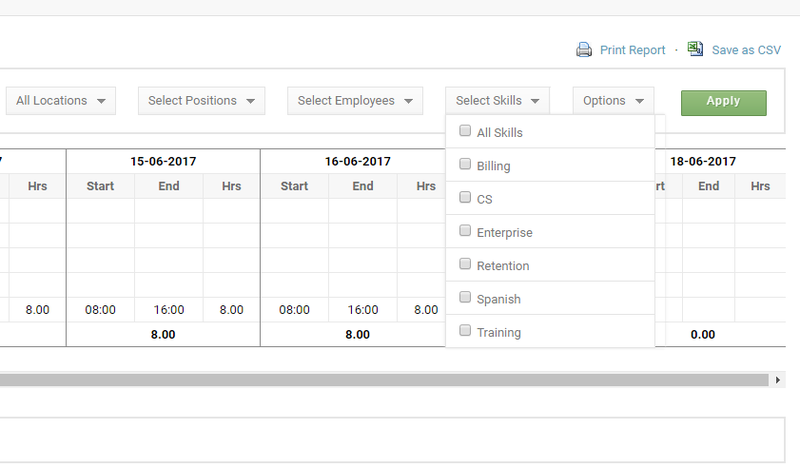 You can use these skills throughout the system to more quickly filter, schedule smartly and track employees. You can filter Reports by Skills to get the desired data by skills. Skills as Seniority: In some scheduling situations it is important to give scheduling preference to more senior staff. For example, within a 'customer service' position, there may exist: 'associate', 'manager' and 'team lead'. Skills as Employment Type: Skills serve as a filter within reports including payroll specific reports. Often times finance staff will need to segment staff into different payroll-related types. Skills can be used to tackle this need with titles such as: 'Salary', Hourly', 'Full-Time', Part-Time', 'Employee' or 'Contractor'. Skills can be used as part of task management as well. Want to get a view of the schedules of your store 'Closers'? What about a look at the clock-in times of your 'Openers'? These are just some of the ways 'Skills' can be helpful as tasks.